I am not a fan of oats and wholemeal breads. I prefer white breads, probably I prefer not having foods which will drop crumbs all over the place. Somehow, they make me feel very dry, and together with cereals drinks, they fall into my category of "unpreferred foods". So last week, when I baked wholemeal bread, it was not for me. It was mainly for my dad. I know he likes them. He buys 1 or 2 loaves every week. But I told him I would bake a loaf last week, so he did not need to buy. This bread is partly organic. Why partly? Which part? Only the flour part. Not all other parts.Organic foodstuff are much more expensive, everyone knows. For our own consumption, it is fine. I hope my diet will eventually be at least 50% organic one day. I do not really like my foods processed extensively, and full of pesticides etc. In any case, I usually try to reduce the "chemicals" in my baking. I tend to add less baking powder, baking soda and less colouring than what is required. I shun recipes which calls for emulsifiers and stabilisers. My theory is, if I have to add all these stuff to my food, then I might as well go to the shops to buy them, what will then be the purpose of homebaked? Oops, sorry I've digressed, back to my bread. This recipe did not require very long proving times, and like all breads, they are best eaten fresh from the oven. I do not know of anyone who can resist the aroma of freshly baked, warm bread. Verdict of this wholemeal bread? It's superdelicious...just because it's baked by me, hahaha! Don't you just feel so happy when you know your family is eating bread without excess chemicals and preservatives? I do. We own a natural family farm and I bake and sell "black dirt" bread using zuchini right off the farm, so I know the main ingredients are organic including our farm eggs. But I have a problem. 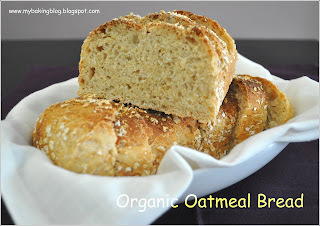 I purchase a variety of organic flours and find that the better quality organic flour makes my breads much too crumbly? I want to use the better flour but I don't know why my breads do not hold together well? Any advice?